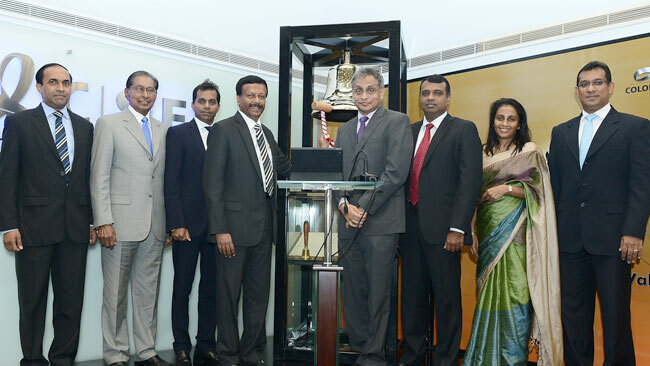 For the first time a special US$ dollar denominated board will be set up by the Colombo Stock Exchange (CSE) targeting foreign investors from the region, CSE Chairman Vajira Kulatilaka said. Speaking after Lanka ORIX Leasing Company PLC (LOLC) rang the opening bell to commence trading at the CSE yesterday Kulatilaka said that this has been actively accepted by Maldivian and Bangladeshi investors. Commenting on the country rating downgrade by Fitch he said that it happens all over the world from time to time. “This is a good signal to wake up and bounce back for Sri Lanka”. Kulatilaka commended LOLC’s continued commitment to SME and regional development through the company’s Micro Lending facilities and invited the company to showcase its credentials at foreign roadshows organized by the CSE in future. “We thank the LOLC Group for taking part in this market opening ceremony, which marks the first day of trading for the month of March. I’m proud to see how LOLC has excelled in many industries and cemented its position as a true conglomerate”. “Lanka ORIX Leasing Company is hoping to make even bigger investments overseas to expand their foot print”, LOLC Group Managing Director and CEO Kapila Jayawardena said.